Ken Whiting was the 1997/98 World Whitewater Freestyle Champion. 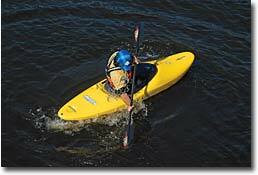 He has produced an award winning series of instructional kayaking books and videos, including two DVDs that provide detailed instruction about learning to roll a kayak: Rolling a Kayak – Whitewater and Rolling a Kayak – Sea Kayaking. Setting up, with body and paddle extended. 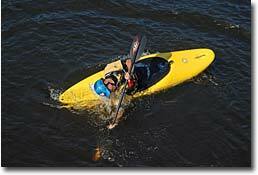 One of the greatest things about kayaking is that, as a sport, it has something to offer everyone. For many, kayaking is simply a means of getting some exercise in the outdoors; but for a growing number of people, kayaking is a sport that provides the excitement of almost continuously learning new skills, refining techniques and the satisfaction of making progress over time. For this latter group, there are some great reasons to take the time to learn to roll, and I can assure you that it will be worth the effort. For whitewater kayakers, rolling is an important skill to master. Knowing how to roll doesn’t mean that you shouldn’t expect to swim every once in a while, because sometimes you won’t have a choice. But, swimming should be one of your last resorts. Aside from being tiring, frightening and humbling, you’re much more vulnerable to hazards when swimming in whitewater. A reliable roll is also a great confidence-builder, which means you’ll be more relaxed on the water and more inclined to try new things. Invariably, this results in a steeper learning curve. Although rolling is not an essential skill for touring and sea kayakers, there’s no question that a reliable roll is a huge asset for many of the same reasons that it’s good for whitewater paddlers to learn: it lets you paddle more safely, helps you be more relaxed on the water and you’ll find your increased confidence will support you in exploring new elements of the sport. These are some pretty compelling reasons to learn to roll, and the fact that you’re reading this probably means that you’re interested in doing so. Are there any limitations to who can learn? Unless you’re allergic to getting your head wet, you’ll be happy to hear that any reasonably fit paddler can learn to roll, because rolling relies on good technique, not power. Hip snap completed, body and head laid back. You might find this hard to believe, but there are over 100 different types of rolls being put to practice today. The vast majority of these rolls were developed by Inuit kayak hunters who relied on them for survival in the arctic waters. Of all these rolls, there are two that are considered to be the most basic and standard types of rolls. They’re called the C-to-C and sweep rolls. Both of these rolls represent a great starting ground when learning. What makes them so popular is the fact that they break the roll into a series of three defined, easy-to-understand steps. To attempt to fully explain how to do either of these rolls in this article would be a futile gesture, so let me instead explain the basic idea. 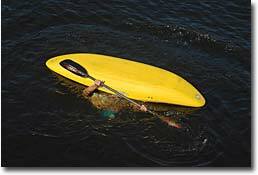 To roll a kayak upright from the upside-down position, you’re going to extend your body out to the side and get yourself as close to the surface of the water as possible. 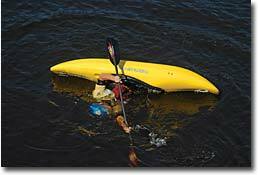 From this position, your paddle will act like a brace and provide the support needed for your hips to roll the kayak upright. Once your hips have rolled your kayak upright as far as they can, your body and head will swing out of the water and over top your kayak—with your head being the last part of your body to do so. Over the years, I’ve had the great fortune (and occasional amusement) of watching people learn in such very different ways. Although most people require the direct help of an instructor, I’ve watched some first time paddlers flip and roll right back up unassisted, having only watched someone perform the roll beforehand. Although a few people have an uncanny ability to pick up the roll, as a general rule the best way to learn the roll is with professional instruction, which you can then put to practice in a controlled, warm-water environment (such as a beach or an indoor pool). Not only will a good instructor, book or DVD teach you to roll more quickly, but they will help make sure that you learn to do it in the safest way possible. A book and/or a DVD on rolling will also serve as a good future reference. They will help you trouble shoot any problems that arise, and they will teach you more advanced rolling techniques.